Do you want peace, space, enjoy, walk, pick olives, taste wine? We have, on our own terrain of 5 hectares, a modern furnished detached house for 4 persons. Casa a Oliveira lies completely free and has terraces around it with lots of privacy. The slightly higher location gives a beautiful view of the surroundings. The design of the house looked at the position of the sun and the cool nights. It is well insulated and we do not use air conditioning in the summer. There is underfloor heating and a wood-fired salamandra for the winter months. In all seasons it is a comfortable house. The holiday home has its own terraces with a pergola. You can always sit in the sun or shade or in the evening enjoy the beautiful starry sky. On the ground floor is the cozy living room with dining area, sitting area and kitchenette. The large windows offers a meadow look at the surroundings and there are books, games and an information folder. The kitchenette has a fridge with freezer, 4-burner stove, microwave and coffee maker. On the 1st floor are 2 bedrooms. Each bedroom has 2 box springs and a private bathroom with walk-in shower, toilet, sink and underfloor heating. Bed linen, bathrobes and towels are provided and a hairdryer is provided. On request we place a baby cot in one of the bedrooms. 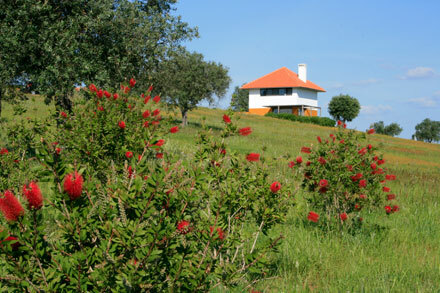 Below you can view the prices of Casa a Oliveira. Filling in the reservation form is not yet a definitive booking. We will let you know within 1 day whether the booking can be honored. If Casa a Oliveira is not available in the desired period, then look at one of our other holiday homes.